UN SDG TRAINING FOR MULTIPLIERS ~ NARARA ECOVILLAGE, NARARA, CENTRAL COAST NSW ~ 13th April 2019! 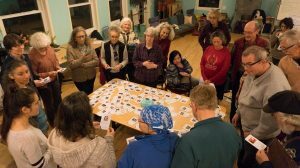 The Working Journey & Global Ecovillage Network, in conjunction with Gaia Education, hosted a specific workshop for building AWARENESS, UNDERSTANDING AND ACTION PLANING. Raising awareness of the importance of the SDGs and their relevance to Australia, businesses, local government and local communities. Supporting business, government, NGOs and the wider community to develop and implement actions, such as projects, innovations, pooled initiatives, resources. Please click HERE to learn more about our successful workshop! The summit is an entirely free, online experience organized with the goal of catalyzing community, exploring the leading edge of the regenerative future movement and increasing our collective consciousness in a climate changing world. Find out more HERE. The ‘National Sustainable Living Festival Australia’ in Melbourne 8-10 February, Federation Square, Melbourne. Be part of a truly global network for sustainable living. GEN Australia is part of GEN Asia and Oceania and are connected to over 30,000 villages where people are living sustainable lives. An amazing opportunity for people already within intentional communities, landsharing communities and ecovillages to come together to discuss, laugh and connect with each other. With a rich timetable and hosted by Currumbin Ecovillage, this weekend will delve into many aspects of living in community and ecovillage design.